The YPI Foundation was convened in October 2006 and is a registered charity organization. The YPI is all about making positive and lasting impact on the society through education intervention initiatives, most especially for abandoned children in homes, in orphanages and hospices. YPI launched the Project Desiree Initiative in September 2008 by starting an Educational Fund to sponsor selected children. Between 2008 and 2010, YPI held 3 annual fundraising events to fund the education of 8 kids from the the Light of Hope Orphanage in Akute, Ogun and the Child Lifeline Home in Ikorodu. 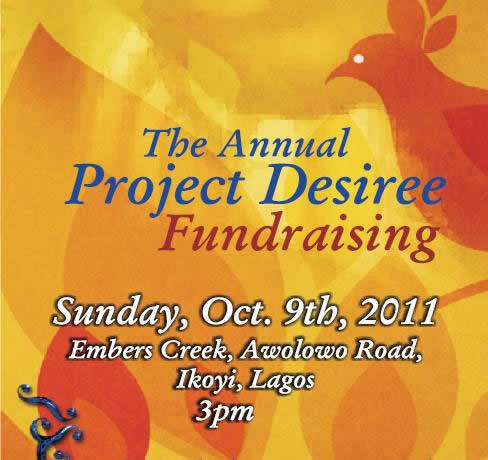 The Annual Project Desiree Fundraising Event coming up on Sunday, October 9th, 2011.The venue is the Embers Creek on Awolowo Road (beside the Lagos Motor Boat Club), Ikoyi, Lagos. The purpose of the event is to raise funds for the continuous funding of the YPI Educational Scholarship Scheme. The Scholarship Scheme was launched in 2008 and currently has 8 kids drawn from two orphanages on full scholarship. Aside the continuous funding of the education of the current beneficiaries, the Foundation is also looking at adding 2 more kids both from the School for the Deaf in Iyana Ipaja. This year’s fund raising event will feature comedy by Koffi, Omo Baba, Owen G and SACO. Timi Dakolo will also be in the house to thrill the audience. Also, a couple of companies will be around to showcase their products and services at the exhibition stands that will be provided at the venue. Please send a mail to ayoolowo@yahoo.com for tickets. You can also get tickets at the venue. A ticket goes for N5,000 and 2 tickets cost N7,500.